This two hundred-year-old house has recently been renovated completely. 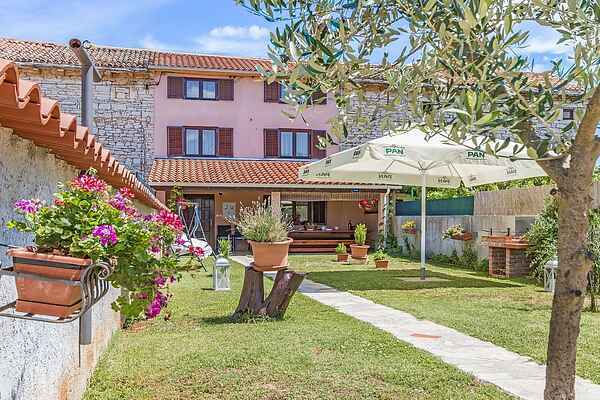 It is located in a small village called Orihi, in south central part of Istria. The house consists of three floors and owns two bedrooms. It is decorated in an elegant and modern style. The front garden is very neatly maintained and gives the house a nice atmosphere. During the summer evenings you can enjoy a barbecue on your terrace, which is furnished with wooden garden furniture and is also covered. The fully fenced yard provides privacy and also safety for children, who can have fun in the playground that belongs to the house. When you are looking for historical sites, it is recommended to visit the nearby town of Barban. You will find beautiful old castles and churches right here, but also a museum equipped with many objects dating from the Roman period. You can even walk through a mine shaft! Moreover, Barban is the proud owner of Glavani Park, where you can practice climbing under professional supervision. A fantastic destination for both sports fanatics and cultural tourists for sure!